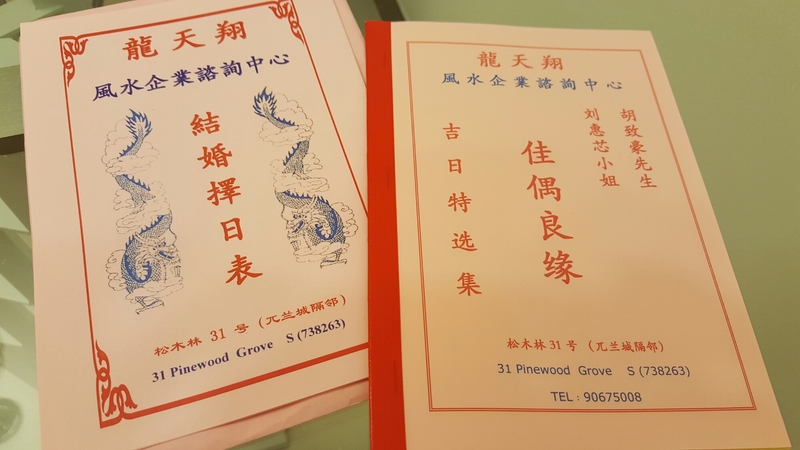 Today we went to visit Master Long Tian Xiang to get our customised booklet of auspicious dates for wedding. Master Long & Master David Tong are the two more popular Fengshui Masters couples approach for picking of wedding dates. Master Long explains how the dates are calculated clearly and was precise, sincere and humorous during his half an hour briefing of what we should do for 过大礼 (纳彩) ， 安床 & 迎娶. We were very satisfied and felt that it was money well spent as a range of dates for 3 years as well as a booklet as guide or instruction is given in case we forget how the details of what we should do.. This book looks exactly like our horoscope books that prepared by our priest after birth of a child. And then those books are used in picking out dates for all auspicious days in his/her entire life like for marriage, starting new business etc. I think it should be similar? Previous Previous post: 1st taobao order arrived!! !